I had the pleasure of hunting with Bill Murphy (ggvg woodchuckchucker) in Shippensburg, PA last Saturday. The hunting was hard because of high crops but we managed to draw blood in the heat & Humidity. As you can see my chest melted and ran down into my abdomen. 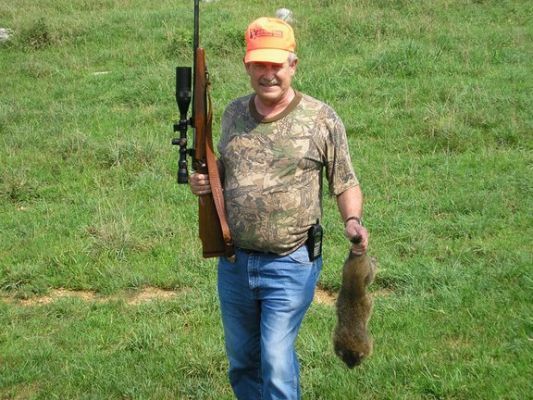 This was my first real groundhog hunt and Bill was a great guide and instructor. He has that gift of being able to pick out parts of groundhogs sticking up in the high grass. Bill has had articles published in The Varmint Hunter Magazine about his groundhog hunting techniques and equipment so he knows his stuff and was willing to share information with me. I wish I had the time to hunt with some of you guys in PA and MD while I was up there but my available time was short. I was using my Winchester M70 Varminter in 22-250 with Simmons 6.5-20x44 mildot and shooting a Hornady 55 gr spfb w/c #2266 using Varget powder, Winchester brass, and CCI primers. Howdy Chris Nice chuck, glad to see ya got some huntin in on your trip did ya make it up to hamburg to the cabelas store that place is awsome!!! any how congrats on the whistle pig. Glad you had a enjoyable trip and got to go after chucks with Bill. Gander Mountain and such I understand 100% but a ton of Hershey Bars & Kisses??? to see you back safe and sound, my friend! You selected one of the best ways to spend a summer day. It just doesn't get any better. I'd prefer earlier before the grass gets up high or freshly after being cut back. You couldn't ask for a better long range caliber than the .22-250. That general area of Pennsylvania and Maryland was my old varmint hunting ground when I lived in the states. Glad you enjoyed yourself. Best wishes. Sounds like you were right in my neck o' the woods, I live 11 miles from shippensburg and 6 miles from Keystone country store. I used to hunt groundhogs pretty seriously, one summer I killed 235. I used a M700 in 243 with 70 grain nosler ballistic tips which I killed well over 1000 groundhogs with.I still take it out some but lately get more enjoyment hunting them with either a flintlock,bow or a handgun,it almost got boring shooting them with a rifle.Glad you had a good time in PA.
Chet, Keep out of my Chocolate Stash !!! I had a ball and enjoyed the shopping. roklok, you live in some beautiful country. All the farms are beautiful and well maintained. I wish I had been up there a week or two later when all the corn had been cut. You need to hook up with Bill Murphy some time. He hunts groundhogs every day after work.